This month I will be spending a lot of time near water, on water, or in water so I thought it appropriate that my masthead coordinated with my activities. The colors and the strokes make this piece look, feel, and move like the ocean to me. I wish I could tell you how I made this design. Truth is, it happened at the very end of a marbling session, with very little paint left, and a very shallow bath of well used size. At this point, I'm physically exhausted and mentally spent. I have a vague recollection of making this piece and admiring it after pulling it from the bath, but I was also ready TO BE DONE with the day. I just wanted to get everything cleaned up so I could sit down to a nice glass of wine and a hearty meal and rest my weary self. It wasn't until I looked at it a few days later that I really took to the design. By then, of course, I couldn't remember how I did it. 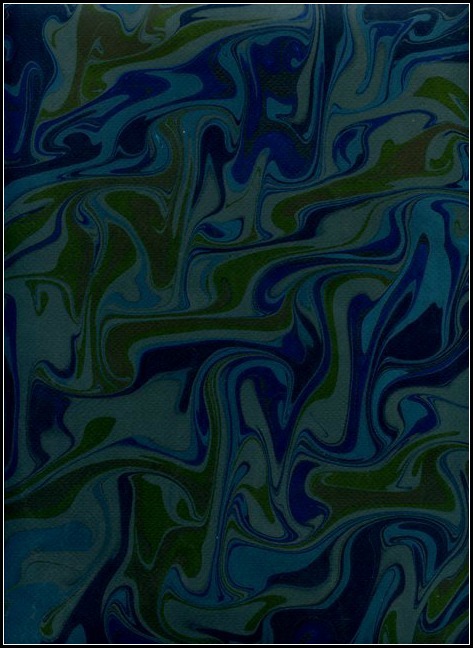 Oh, well...just another "happy accident" in the marbling world.